Sauce making is not an art form. Art relies on inspiration to come to fruition. If diners waited for chefs to be inspired to create sauces, there would be a lot of dry food and hungry patrons. 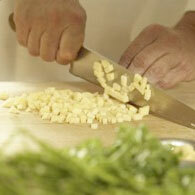 Sauce making is craftsmanship. A craftsman learns to utilize his tools, materials and skills to create a superior product. Art is admired from a distance. The product of a craftsman is utilized and enjoyed by the consumer. Craftsmanship can be learned. So can building great sauces. The function of a sauce is to elevate and enhance the focal point of a meal. Some sauces are painstakingly built over hours and even days. These sauces are the pinnacle of the saucier craft. They require time and patience, two ingredients often in short supply for the home cook with a hungry family that wants to eat ten minutes ago. Good, even great sauces are within reach of the home cook. The place to begin to learn the craft of sauce making is at the bottom of the pan. The humble pan sauce is quick, easy and delicious. The key qualities of a sauce are flavor, appearance and texture. The building blocks to achieve these goals are a flavorful liquid, aromatics and a thickening agent. Pan sauces provide the cook with an added flavor tool, deglazing. Searing and roasting proteins creates a caramelized exterior to the product yielding the yum factor which provides the bulk of flavor to the dish. This flavor is also left behind in the pan this can be incorporated into your sauce by deglazing with a liquid. This liquid is often wine or booze but can also be stock or even water. This is then reduced to fortify the flavors and thicken the sauce. Enough of the theoretical jargon, we will walk through the basic pan sauce. Follow these steps and you can create a multitude of dishes by simply varying the ingredients. To make Scallops with a Mushroom-thyme Cream Sauce, dry the protein. Moisture is the enemy of browning. Get your pan hot and have all your ingredients close by. This is going to happen fast. Add oil to hot pan. Sear protein until brown on both sides and remove. Don’t worry about cooking the item thoroughly. It can be finished in the oven or returned to the sauce to finish. Add mushrooms, shallots and garlic. Move pan or stir to cook items quickly and avoid burning. Add sherry or white wine and reduce until most of the liquid is gone. Add cream and simmer until the sauce coats the back of a spoon. Finish with fresh herbs like thyme or tarragon. Add the scallops back in to warm. Taste the sauce. Adjust seasonings and serve. Don’t like scallops? Use shrimp, chicken or veal. Don’t want a heavy cream sauce during swimsuit season? Use stock or even carrot juice. The ingredients can be varied to suit your own tastes, the technique for building the sauce never varies. That is the mark of a good craftsman. Enjoy this month’s video and recipe for creating a pan sauce. Look forward to hearing about the dishes you create utilizing this template. Heat large sauté pan over medium high heat. Add oil. Let come to temperature. Brown scallops 4-5 minutes per side remove. Add mushrooms, shallots and garlic. Cook until softened. Deglaze with sherry. Reduce liquid by two thirds. Add cream. Reduce by half. Add tarragon, salt and pepper. Add scallops back into sauce. Warm and serve.